Today, we saw the ending of Gatchaman Crowds, which probably holds up the title for quirkiest anime of the Summer 2013 season. And yes, the very end was weird, but the ending was exceptional. So let’s get to it. If you want to see where Gatchaman Crowds ended up in my list of rankings, head on over here. Want an example of a character taking over a show? Hajime does just that. Gatchaman Crowds, a reboot of the 1972 series Science Ninja Team Gatchaman, is not your typical superhero TV show. Early on, it reminded me a lot of Teen Titans, but as the show went on it differentiated itself as something totally unique. Noted throughout the season for its deconstruction of many cliches of the genre, Gatchaman Crowds continually and deliberately avoids many tropes and dodges expectations time and time again. What we end up with is an intelligent, engaging and ultimately hopeful message on the inherent goodness of humanity and a clear message that violence isn’t always the answer. 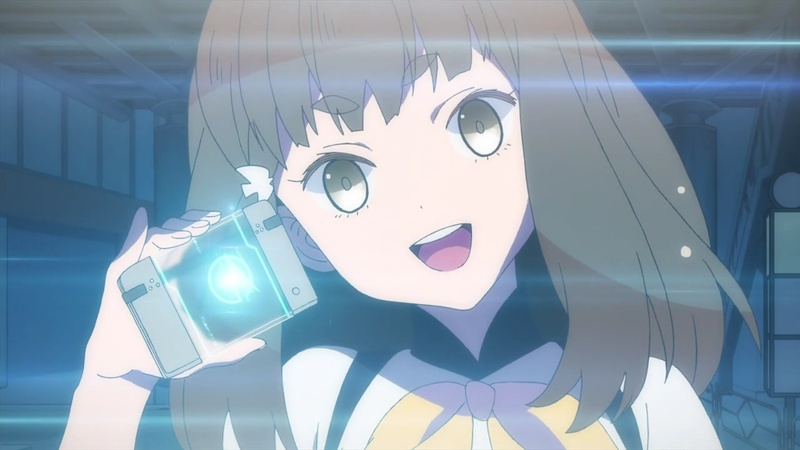 Our main protagonist is Hajime Ichinose (seen above), an hyper-energetic sixteen year-old girl who is chosen to be a Gatchaman, or a protector of planet Earth, at the beginning of the series. Hajime is the focal point, the driving force and the deliverer of the show. Initially, she appears to be nothing more than a ditzy teen, but she quickly demonstrates that she’s a lot smarter than she lets on. Additionally, her relentless optimism and positive outlook on life hold up the main themes of the show. Without Hajime, Gatchaman Crowds would never have been more than a run-of-the-mill superhero anime. Hajime’s counterpart is Rui Ninomiya, a cross-dressing boy who runs the incredibly popular social media program known as GALAX. 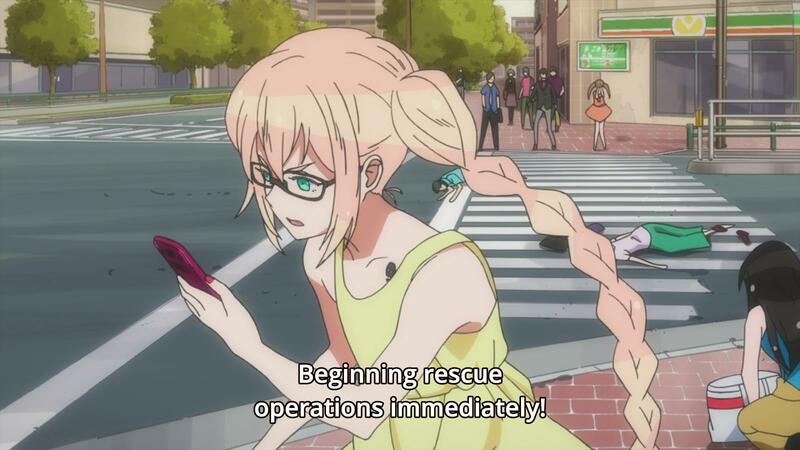 Gatchaman Crowds is unique in the fact that Rui is essentially a second protagonist. Hajime and Rui are, at their cores, essentially the same in beliefs and goals. Although their methods differ greatly (and Hajime uses Rui’s GALAX program), each has an unwavering faith in the capacity of mankind to improve itself. Hajime works on a more individual level, simply by living her life through her rose-tinted glasses; Rui seeks to “update” the entire world through the use of GALAX. The problem is that a unique function of GALAX, the CROWDS, was given to Rui by an alien known as Berg-Katze, which seeks to destroy Earth. For a long while, Rui refuses to use the CROWDS, excepting emergencies; however, eventually Katze takes over GALAX and bestows the CROWDS ability on a large group of users. If Hajime and Rui are the thematic spine of Gatchaman Crowds, GALAX and CROWDS are the channels through which those themes are transmitted. In our current world, dominated as it is by social media sites like Facebook and Twitter, GALAX does not seem like such a strange concept. It is functionally the same as the social media technology of today: it can be very good if used for good, or cause great harm if used for evil. However, GALAX is never set up to be a warning. It is merely the field on which humanity is tested. Gatchaman Crowds’ greatest boon is its beautiful message that humanity is, at its very essence, good. As Hajime says, everyone has the potential to be a hero, a force for good. Through Hajime and Rui, humanity is given a chance to prove its goodness, and although it stumbles along the way (as we humans are so apt to do), it ultimately triumphs over the malice and cunning of Katze. In a world where humanity is so frequently despised or presented as hopeless, Gatchaman Crowds’ message of faith and hope is beautiful and very welcome. Artistically, Gatchaman Crowds measures up to the best of this season. The animation is, like the show, colorful and quirky, with the neon-infused Gatchaman forms and the OP animation being special highlights. The soundtrack, headlined by the dubstep/electro-pop Gatchaman theme song, “In the Name of Love,” is perfectly matched to the mood of the show. The unique qualities of Gatchaman Crowds make it an anime deserving of your time. From the descontruction of hero tropes to Hajime’s relentless (there’s no other word for it) joyfulness to the animation and music, Gatchaman Crowds stands as a tribute to the inherent goodness of mankind. It is undeniably eccentric, but its oddball nature is part of the strong charm of the show. Gatchaman Crowds gets a definite watch recommendation from me. Hajime Ichinose dominates this show from start to finish and she is a joy to watch on screen. Her worldview, idealized as it may be, sets her apart from the heroines of recent memory. GALAX is a fascinating form of media, and the implications of its use are relevant to the modern world. A message of hope, affirming humanity’s inherent goodness. Colorful animation, some sweet tunes and across the board quality production.